The final blog post in the series of deconstructing children’s books representing the historic space of pre- and post-1867 is on Confederation itself: What books are available for children on Confederation? Do these books connect with other events that happened at this time, like the themes addressed earlier in this series: residential schools, the fight for women’s rights, or the importation of labour for the railroad? What does the history of Confederation as told through books for children tell us about the meta-narratives that many people hold about the “birth” of Canada? Like my previous research, I began with a library search, and unsurprisingly, Confederation was easy to find. I didn’t have to be creative about my search criteria or word choice. I typed in “Confederation,” specified books for children and youth, and waited to see what came up. This search easily produced 26 results, 20 of which were actually books on Canadian Confederation. Like books I found on the railway, these books were often part of a series of books and had some very creative titles, such as Confederation, Confederation, Confederation, and Confederation. For the most part, all the books were nonfiction for readers 8-12 and followed a similar pattern of text with archival photographs, paintings, and/or illustrations. All the books were text heavy. Very text heavy. Even books with more graphics were organized into chapters as a way to break up text. And John A. was everywhere. On every cover. In every text. There were some books that situated Confederation in larger discussions of the expansion of the West or the development of the railway, and John A. was still everywhere. However, unlike, suffrage, in which you couldn’t get to the topic without Nellie McClung as a rallying narrative, it was easy to talk about Confederation without hanging onto John A. Instead, he was continuously framed as a figure – a major figure – whose importance should be acknowledged, but others, such as George Brown, George-Etienne Cartier, and Louis Riel, were acknowledged too. Women were never featured in any of the books, and if mentioned, were referenced in paternalistic ways such as “their wives and daughters” there to enjoy the parties. 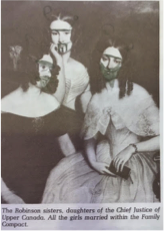 Interestingly, the image of the only women who were explicitly named in the books I consulted (who was not Queen Victoria) had been defaced. When looked at as a whole, it was clear that the function of these books was to teach about the foundation of the nation, and the text and layout of the books served this purpose. The books rarely diverged from a roster of facts, dates, and names and were unapologetically dry and colourless. Books on Confederation were written to explicitly set the tone for the “founding” of Canada, and deference to the history was privileged over engagement with the past. So the prominence of John A., the lack of women especially outside a traditional “wives and children” discourse, the repetition the Founding Fathers photograph in Charlottetown, the tokenistic images of First Nations people, the Riel portrait reminiscent of a mugshot, all of these graphics and the heavy text that surrounded them, all functioned to narrate Canada in ways that the reader was supposed to know and respect. This is Canada’s narrative. End of discussion. These findings are especially interesting when thinking of the lackluster Canada150 celebrations this year. Many were unsure what and how to celebrate in ways that demonstrated a love for Canada while also respecting and acknowledging the painful and violent unfinished history that haunts this land. One may want to celebrate Canada, but not Confederation in these sanctioned ways. Why? I venture that these books on Confederation are indicative of the ways in which we are expected to understand the “birth” of Canada, and that people are tired of these dull, one-dimensional, stories of this moment in history. Canada150, as an organized series of events, was just this narrative with fireworks. You don’t have to read any children’s books on Confederation to know instinctively what they were about and how it was going to be presented. The metanarrative of the “founding” of Canada involves Confederation – John A., “wives and children,” Charlottetown compromises – and does not involve, let alone contribute to, other happenings of this period, such as residential schools, the fight for women’s rights, or the importation of labour for the railroad. Canadian history is often perceived as dull, but I argue that Canada’s history has been made dull in order to obfuscate the diversity of experiences that were legislatively supposed to be outside the experience of the newly confederated Canada. The children’s books I have read on Canadian history demonstrate this clearly: Histories were not connected, they were segmented, they were away, they were individualized, they were framed as outside Canada, they were individual pockets of experiences that had no relation or reaction to each other nor the nation at large. Thus, in order to move forward with the stories we tell about Canada, we need to demonstrate the connections among events and experiences in ways that rewrite our histories to acknowledge and recognize that conflict and contestation have been, and are, part of the Canadian experience. And that this recognition can build a stronger foundation for Canada to stand on, not a weaker one. I conclude this series by putting out a call to historians, authors, illustrators, and especially publishers to think outside these narrow tropes for narrating and presenting national history for young Canadians and to question what stories are more demonstrative of where we have been and where we are going. Interestingly, in hindsight, the books on residential schools which I covered in my first post, were the most interesting, nuanced, and affective of all four topics. These books were also the most current, with many being published in the last 10 years rather than the last 20 to 30. The publication of these books demonstrates the need to tell these stories of the past and present in different ways than we are used to and that there is a market for these stories to be shared and discussed. With high rates of immigration, a call to develop reconciliatory relationships between indigenous and non- indigenous peoples, and a developing sense of transnational Canadian identities among Canadian youth, the diversity of perspectives that we are all exposed to are even more relevant than they have ever been. Canada, why so dull? There’s so much we have to work through! If only your search had included the words “Canadian immigration” you would have found my newly released/revised Making Canada Home: How Immigrants Shaped this Country (Owlkids Books, 2016). I think you’d find it meets most of your criteria for a “non-dull” historical exploration of the diversity of experiences and perspectives within what is now Canada. I’m saddened by this article. What does it say to the young Canadian who actually enjoys one of the books on Confederation that the author disparages as dull? It is one thing to suggest that a children’s book has over-simplified, or that the lack of nuance does not do justice to the history or the historical process. These are issues that can start a conversation, and that allow for a variety of interpretations. It seems to me that it is quite another thing to condemn a book subjectively as dull or boring, particularly when doing so from a position of authority. At a time when students are flocking away from history at the university level in droves, surely we can embrace more inclusive language in our approach to historical analysis and thinking. Should we not welcome interest in history, and particularly Canadian history, among 8-12 year-olds in any form? If children happen to enjoy a book that we find wanting, should we not try to engage with them and encourage them to read more rather than writing off their taste as dull and one-dimensional?